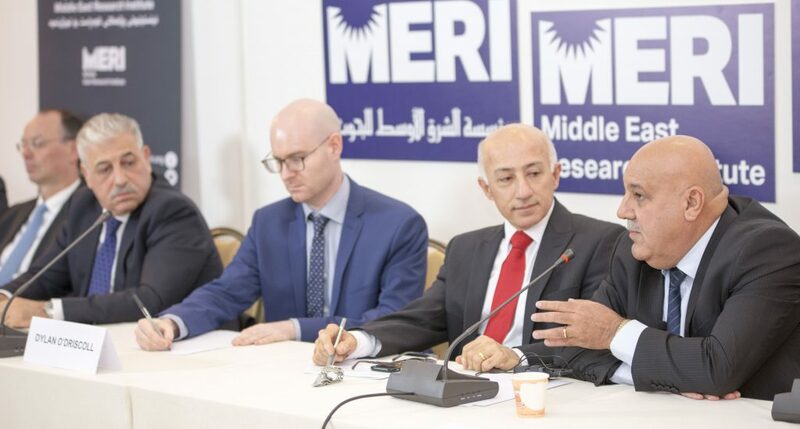 On 28 September 2016, MERI hosted a roundtable discussion to debate “The Future of Mosul: Before, During, and After the Liberation”. 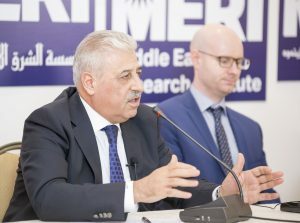 The roundtable discussion featured Dylan O’Driscoll (MERI Research Fellow), Atheel Al-Nujaifi (former governor of Nineveh), Jabar Yawar (Secretary-General of the Ministry of Peshmerga). Dylan O’Driscoll, author of the the recently released MERI report The Future of Mosul: Before, During, and After the Liberation presented the findings of his work to local and international policy-makers. The key message of the report is that prior to launching the final offensive against IS in Mosul, non-military aspects of the future of the city need to be addressed. In particular, he stresses the importance of humanitarian planning, issues of governance, and post-conflict security, reconstruction, and reconciliation. During the roundtable O’Driscoll reiterated that serious gaps persist in the planning of the Mosul operation and its aftermath. To begin with, a humanitarian response to the expected flow of IDPs to both the Kurdistan Region and areas under the Federal Government’s control has not yet been completed. Additionally, there is no overarching agreement between the actors involved for the process. The recent displacement of Iraqis from Fallujah is an indication of the challenges that the Mosul operation will pose. Any humanitarian response to population flows should carefully evaluate what life was under IS and what alternatives the liberation of Mosul can offer to civilian population. Strictly related to this insufficient planning, is the apparent lack of commitment to the much-needed reconstruction of Mosul and Nineveh province that extends to issues of reconciliation and justice. At the moment, there is no plan for post-conflict reconciliation, let alone mechanisms for dealing with IS militants and supporters, such as Truth Commissions or specialized courts. While various options are available, having a concerted stance towards reconciliation would signal a commitment to address the root causes that led IS to capture the city. A further aspect is the lack of a comprehensive political agreement between local and national actors on the future of Mosul and the Nineveh province. On this point, O’Driscoll recommended that new mechanisms should be agreed upon in order to decide, and eventually solve, the status of the disputed areas between the Kurdistan region and the Federal Government. Similarly, key concerns of the Sunni community in Nineveh province need to be addressed within the wider political and constitutional dynamics of Iraq. According to O’Driscoll, the message that Baghdad is sending towards Sunni Arabs in Nineveh raises fears that the marginalization of Sunni actors and population will continue after the liberation of Mosul, perpetuating exclusionary dynamics that preceded IS taking control of the city in 2014. For example, predominantly Shiite militias Hashd al-Shaabi will according to PM al-Abadi participate in Mosul’s liberation, despite the Nineveh Provincial Council previously voting against their participation. In all, the question on whether local, national, and international actors are prepared for the operation in Mosul and its aftermath reveals scarce attention towards non-military aspects of the future of the city. Atheel al-Nujaifi grounded his presentation in the recent history of Mosul and Nineveh province, which he opined had been in previous decades used by governments in Baghdad to curb the ambitions and interests of the Kurdish national movement. Since 2003 there was, according to his observations, a rise in nationalism in Mosul which led to public mobilization against the Kurds and damaged Arab-Kurdish relations. Moreover, since 2003, there has been an imbalance of forces in the area while some minorities were getting stronger, and others were politically marginalized, especially Sunni Arabs. Nujaifi expressed his concerns over the possibilities of engaging with religious extremisms in any constructive way. In particular, he drew attention to areas in the Nineveh province that have been outside of any government authority over the last six or seven years. In his opinion, these are the areas that saw a growing concentration of religious extremists and he warned that after the Mosul operation, they could continue to be strongholds for militants. In political terms, Nujaifi called for a direct and comprehensive involvement of representatives from the Nineveh province into the discussion over the future of Mosul and the Nineveh province. He stressed the importance of limiting the influence of Baghdad and Erbil over the future of the province, while at the same time he called for changing attitudes towards the disputed territories, which should be considered as ‘combined-interest areas’. He also considered it crucial for the international community to supervise the situation in Mosul in order to ensure reconstruction efforts and to rebuild severely damaged trust between various people of Nineveh. Jabar Yawar focused his presentation on on the military issues connected to the coordination and execution of the Mosul operation. He highlighted that all parts of the Iraqi forces will participate in the offensive, including Peshmerga units, but that only the Iraqi army, the local police, and the federal police will remain inside city. General Yawar also discussed coordination mechanisms between various armed forces participating in the Mosul operation ranging from Iraqi or Kurdish forces to the logistical and aerial support of the international coalition. Various command centers, he states, have been established in order to ensure proper coordination of the whole operation. In his concluding remarks, he agreed with O’Driscoll’s analysis that there exist various issues over the future of Mosul that need a political response beyond the military operation. The presentations were followed by a roundtable discussion under Chatham House rules. 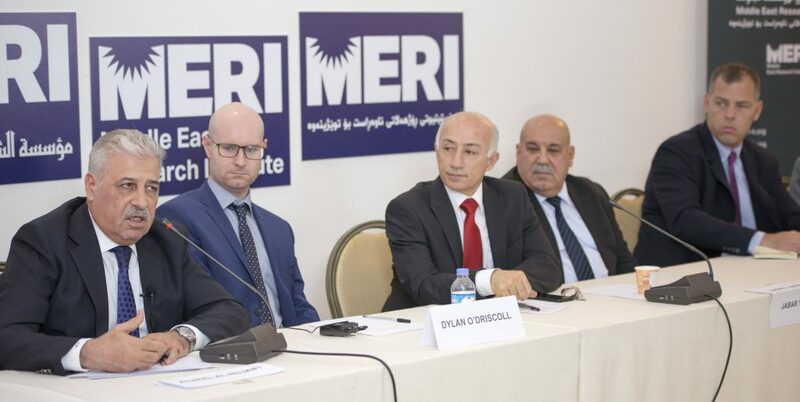 MERI offered a neutral platform where international policy-makers, including but not limited to representatives of the American, British, German and Turkish consulates, as well as local and national policy-makers, activists, and academics shared their opinion on the Mosul operation. MERI’s Visit to Washington D.C.